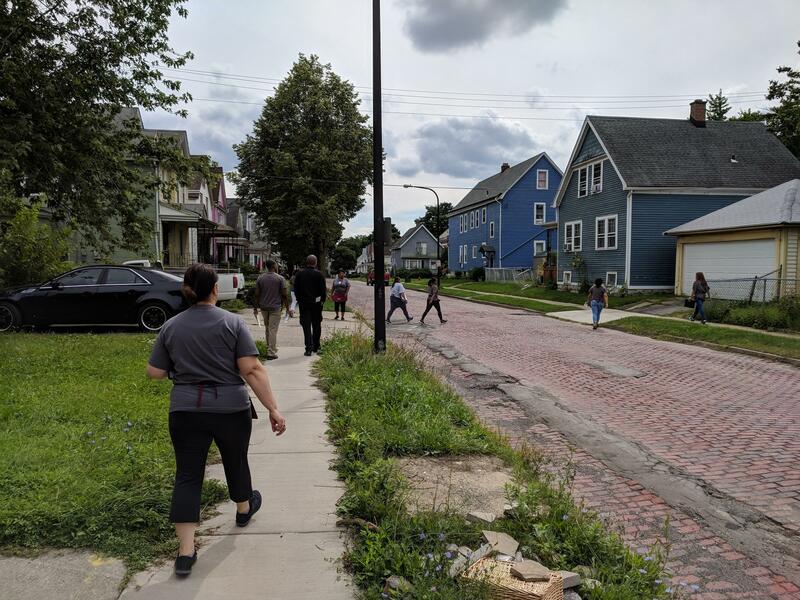 Community Health Workers with the Buffalo Prenatal-Perinatal Network head out into Buffalo's East Side neighborhoods looking for women in need of their services. How do you help mothers and babies in need? One door at a time. WBFO's Avery Schneider spent an afternoon in an upstate New York neighborhood to see how a local agency does it. It’s mid-afternoon in the office of the Buffalo Prenatal-Perinatal Network -- a more-than 30-year-old not-for-profit focused on improving outcomes for babies and mothers. There are a number of ways they do it, but one of the most effective is with good old-fashioned footwork. “So we’re going door-to-door looking for the clients that haven’t accessed care yet for whatever reason – if there’s stigma, they just don’t know where to go, they’re worried about going. We try to find those cases that are scared, or need shelter or whatever, that aren’t in the system yet,” said Sherrell McLean, care coordinator for a team of about a dozen Community Health Workers – CHWs for short. Nearly every week, the CHWs hit the streets of Buffalo, visiting sites picked by CHW Program Manager Marixsa Sanchez. “So tell me about this neighborhood today. 14215, right?” asked WBFO’s Avery Schneider. Some parts of the neighborhoods visited by Buffalo Prenatal-Perinatal Network's Community Health Workers are rougher than others. As recent as 2016, the rate of infant mortality in this East Side neighborhood was more than 13 deaths for every thousand babies born, and low birthweight was a staggering 13 percent. 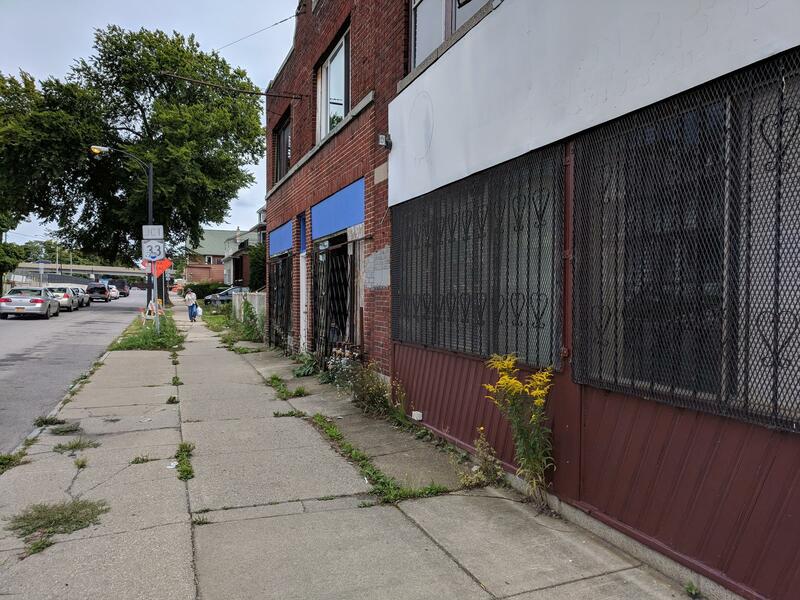 It’s among the city’s worst outcomes, nearly double the county average, and a long way away from nationally set goals for 2020 of 5.9 per 1000 for infant mortality, and a reduction of low birthweight to 7.8 percent. “And that’s just one of the poorer sections of town,” Shelton said. Sanchez said statistics tell her one in every six girls in 14215 will get pregnant. Most of the clients her team finds are black or Hispanic, ages 18 to 23. With their grey and maroon t-shirts and aprons, the CHWs fan out across both sides of every street they canvass. Sporting grey and maroon T-shirts and aprons, the CHWs are a visible presence in the neighborhood. They walk briskly from door to door, in and out of shops, even stopping people on the sidewalk for their key question. “Do you know anybody who might be pregnant or parenting with a small child?” her team asks a woman coming out of a corner store. But not all interactions are like this. Finding someone who knows a pregnant woman or a new mother is somewhat common, but finding the woman herself can be rare. On this particular day, the team gets lucky when a resident points them towards Aarona Wardlaw. She had given birth only 15 days before to a baby girl named Journi, and it’s her second child. “They’re coming out here offering free services to people in the community. What does that mean to you?” Schneider asked. “It’s appreciated because some people don’t do it. So it’s nice,” Wardlaw said. “What kind of services do you look for now that you have a new baby?” Schneider asked. “Whatever I can get,” Wardlaw said. “What’s most important to you?” Schneider asked. 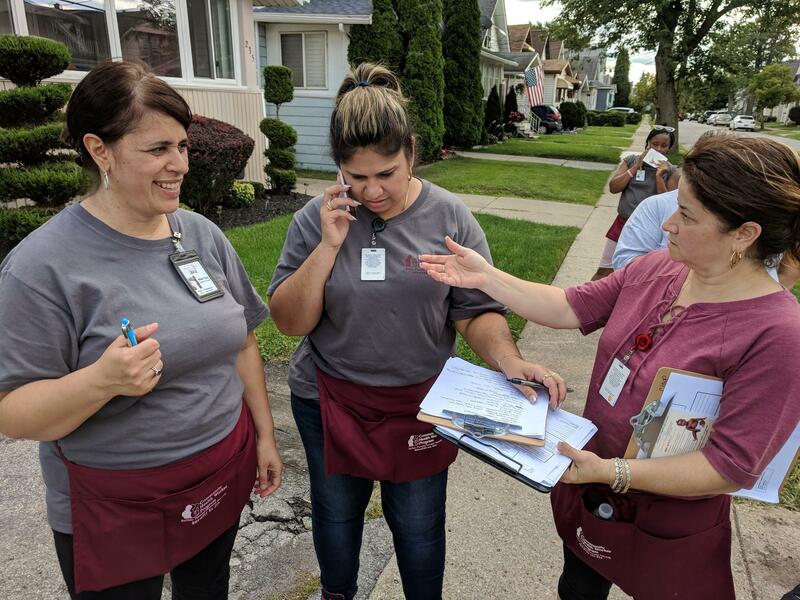 Marixsa Sanchez (left) and her team coordinate their movements through Buffalo's East Side neighborhoods, especially when they find a potential client or someone who needs an on-the-spot assessment. After an initial interaction, one of the CHWs circled back for a mini-needs assessment to find out what items Wardlaw might need as soon as the next day. Within the week, another CHW would be back to find Wardlaw for a full assessment and bring her on board as a client of the Buffalo Prenatal-Perinatal Network. They’ll make sure she gets insurance, a doctor for her and her baby, and even take them to their visits to help advocate. And that’s just the beginning. Mothers can stay in the program until their child turns 2. By that time, CHWs will help make sure they’re in better housing, working or going back to school, and – in general – living a better life. It’s hard work helping change a community one door and one person at a time. But after 23 years in charge of this outreach program, Sanchez and her team are not giving up. Health and wellness is a popular topic these days. It's not just exercising or eating well anymore. With increased interest comes some new ideas – and new research to back them up. Some of those ideas can seem a little extreme. That’s what we’re exploring this time on “Take Care,” tune in for more on health and wellness extremes. You’ll hear discussions on new algorithms to help diagnose rare disease, the idea of “positive stress” and what it means for our longevity, why the anti-diet movement doesn’t have to be all or nothing, how one organization is literally going door to door to make a difference, and more.